Manufacturers of gaming software often devote their slots to the theme of nature and its inhabitants. 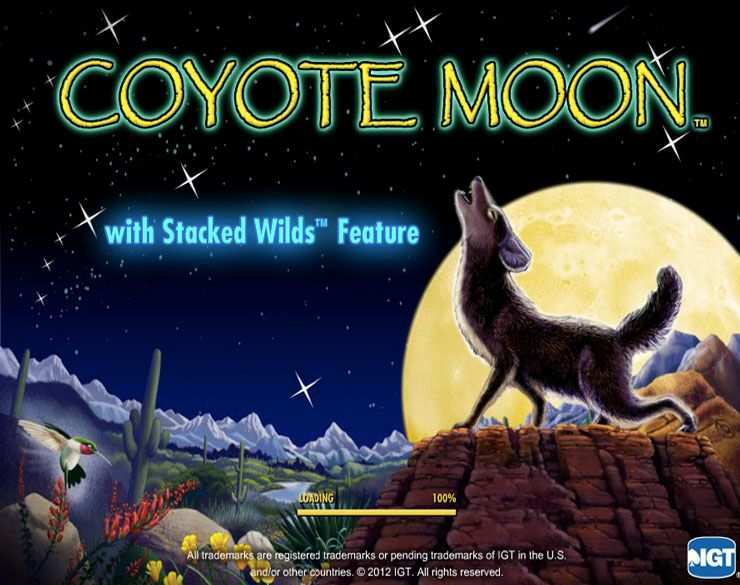 IGT also did not stand aside and released the Coyote Moon game. The main heroes of the machine are wild animals that perfectly fit into the general theme of the device and guarantee quite large cash prizes. The desert unfolds its door inviting the gambler entering it and gaining valuable experience, relaxing during the process and coming out of all dangerous adventures as a winner. The IGT slot resembles a desert, where not only friendly, but also dangerous animals are found. These fauna representatives make unique combinations for which the gambler later receives real money rewards. The player will have to get acquainted with many animals and birds that exist in the same space as coyotes. Corresponding symbols, alarming music with animal sounds contribute to the players’ complete immersion into the game process. Tuning in for the game, the casino visitor will finally get worthy monetary rewards for certain meaningful combinations formed at 40 lines and 5 reels. Coyotes hunt mostly at night, when other animals are asleep. During the day these predators rest. Coyote Moon slots have 2 modes: night and day — the symbols change their color, but the payout remains the same. The slot offers only the main game (no additional ones). It also does not offer any of jackpots. The bet size here is determined by pressing the + next to the Line Bet. The bet for one active line cannot exceed 50 credits, while the minimal one is 1 credit. Sometimes the amount withdrawn from the account when you bet exceeds the sum charged for the combination. However, when you take risks, the reward will not take long. As for the number of active rows, it is adjusted by pressing +/- near the Lines. The gambler can always reduce the quantity of the paylines and pick less than 40. However, you need not set too small bets and choose only a few paylines. You have more realistic chance of compiling some profitable combination when you use more lines. The player can constantly observe all fixed numbers in special game fields, and then control the gameplay. Another mandatory for viewing field is PayTable, which contains information about the rules of Coyote Moon slots, the structure of active paylines and the combination table. The Spin and AutoSpin respond to the spinning of the reels. The first function allows you to make only single spins, and the second one can make up to 50 continuous rotations with previously established game indicators. If necessary, the gambler can use the button, which shows the digestible graphics quality. No one wins without risking; however before gambling play free Coyote Moon casino slot machine. Enjoy this fascinating game graphics, cool sound effects and an exciting story, the main characters of which are wild animals living in the desert. When passing all the dangers of this game, you’ll win. 0 responses to "Coyote Moon Slot"